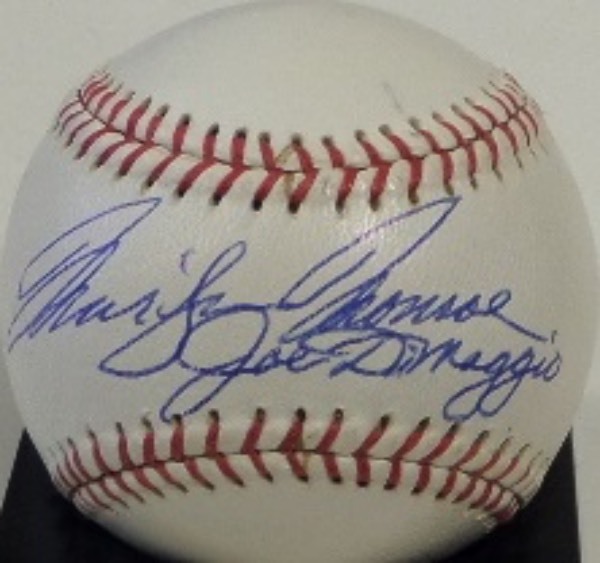 Coach's Corner - Marilyn Monroe & Joe DiMaggio hand signed/certified baseball. Go Back to Lot List Marilyn Monroe & Joe DiMaggio hand signed/certified baseball. This must have, top collectors ball is white, red-laced, and circa 1950's by Wilson. It is basically new, comes blue ink, sweet spot signed by both the celeb and the ball player, and grades a clean honest 9 all over. Better yet, a Barry Halper hand signed LOA accompanies, and we have seen one sell for mid-thousands already. Great opportunity, and as always, with basically no reserve.